It’s not very often that a first-time art contestant is awarded 3rd place. That’s exactly what happened for Mirim, a PSE student from South Korea, in Rockford, IL. 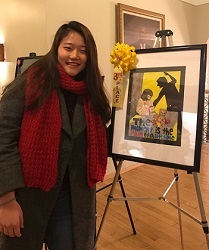 Mirim entered a national art contest in Rockford with the theme of violence. Her painting was awarded 3rd place. Being able to participate in the art contest was a fantastic experience in which she felt supported and validated by the event. 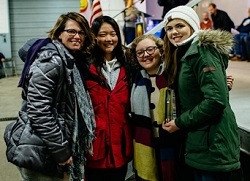 “This is my happiest moment ever in Illinois because it was my first art contest in the U.S. and my host family celebrated with me,” Mirim shares. 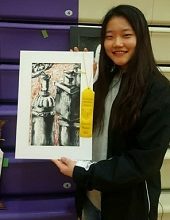 Though it was her first national art contest award, Mirim, who just finished her second year on the PSE program and will return for a third year this fall, has received recognition for her artwork on several other occasions. 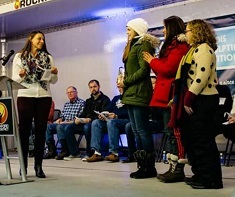 There was the ice sculpture contest, in which Mirim worked on a team for three days outside in the cold Midwest winter weather, during which she and her teammates sculpted through muscle pain, aches and frozen fingers for 29 hours. 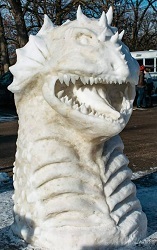 The result was an ice dragon for which her team was awarded second place. And, for her first time ever painting with chalk, Mirim was awarded honorable mention and first place. 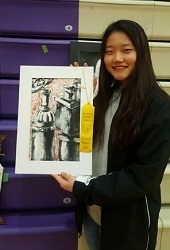 Mirim discovered her artistic talent and passion while on the PSE program. 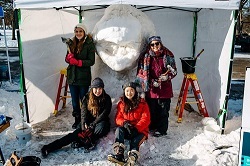 Through the experience, she has become inspired to continue with her artistic endeavors and eventually earn a degree in Art after graduating next year. She would then like to pursue a career in Art. Mirim has had a well rounded experience on the PSE program thus far. She has participated in Cheerleading, played on the soccer team, attends church with her host family, and has made many great friends. She states, “The best of this experience is my host family! They are so nice and really good to me. I have such a good time with them.” She has formed great relationships with her host parents and two host brothers, and enjoys the family dog. Looking back, Mirim reflects that the most difficult time was during her first year on the program when she had to “relearn” everything, from family life, to school, and of course, to meeting new friends. She adds “it is hard to know somebody!” Now, she is proud to say that she has many friends and loves her host family. We look forward to having Mirim back for her senior year, and to witnessing her growth and continued success in her artistic pursuits, as well as other passions she might discover along the way.